Contractors: H.S. Bingham & Co.
Hocken Collections / Uare Taoka o Hākena. Foster Series No. 4, Box 136. Over 500 community war memorials honour the more than 18,000 New Zealand soldiers who died in World War I. They are expressions of remembrance for the loss of family, friends, citizens, and brothers in arms. This month they are focal points as the country marks the centenary of the end of the war. Memorials built before the armistice include one at Kaitaia unveiled as early as 1916, but most date from the years after the war. In Otago, the busiest years for construction were 1921 to 1923. The Dunedin Cenotaph was not completed until 1926, and Andersons Bay unveiled its memorial arch in 1928. Monuments took a variety of forms, including obelisks, statues, arches, and gates. Practical memorials were more common after the Second World War, but examples following the Great War included hospitals and libraries. The description ‘War Memorial’ was most prevalent, but ‘Fallen Soldiers’ Memorial’ was also common and placed emphasis on the dead rather than the conflict itself. Commentary from the time shows an awareness of this. 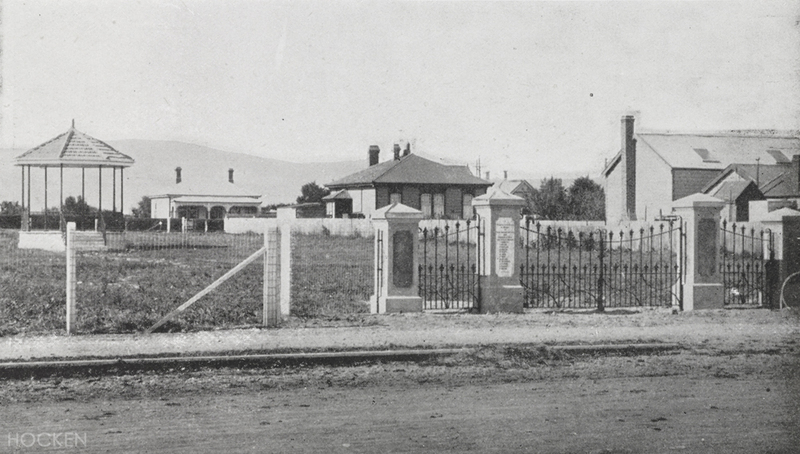 In April 1920, the Taieri RSA sought progress towards a memorial for the Taieri Plain. In response, the Mosgiel Borough Council organised a public meeting, held in May. RSA President Ivan Spedding suggested ‘something in the shape of a rough-cast monument’ with marble tablets. Little was settled, but there was enough momentum to get the project underway. A further meeting in July elected a committee chaired by Mosgiel mayor William Allan. Other members represented the RSA, the church, patriotic organisations, and the borough and county councils. Fundraising efforts began with a concert in the Coronation Hall. Performers included singers, instrumentalists, a dancer, a ventriloquist, and comedy jugglers. In March 1921 the committee called for submissions for the design, and the site was debated at a public meeting in May. The leading suggestions were Gordon Road itself, and Mosgiel (now Anzac) Park. The park won out in a close vote. Mosgiel Park was the gift of the Taieri Amateur Turf Club, which on closing had left funds for the purchase of a reserve. Opened in April 1919, it featured paths and lawn, ornamental entrance gates, and a band rotunda. In July 1919, peace oaks were planted on either side of the entrance, one by the mayoress Mrs Allan, and another by Dr Spedding on behalf of the RSA. Mosgiel Park as it appeared when it opened in 1919. Otago Witness 21 May 1919 p.33 (Hocken Collections). A proposal to dismantle the centrally-placed rotunda to make way for the memorial offended park donors, who threatened legal action. The monument was instead built inside the gates, close to Gordon Road. The rotunda and gates survived another 50 or more years before they were removed. Referred to in reports of the time as the Taieri Fallen Soldiers’ Memorial, the monument named soldiers from Mosgiel and the wider plain but excluded West Taieri as a separate memorial had been built at Outram in 1921. The committee placed an advertisement inviting parents and families to provide names, and in July 1923 published a list and invited corrections or additions. The successful submitting architect was David Mowat (1880-1952). Born in Dunedin, he had worked as an assistant to Edmund Anscombe before studying at the Architectural Association School in London. He established his own practice in Dunedin in 1914. His works included the Donald Reid Wing for the Otago Early Settlers’ Association, Constance Hall for Columba College, Maori Hill Presbyterian Church, and various commercial and residential buildings. He also designed the war memorials at Port Chalmers (since demolished) and High Street School. Architect David Mowat’s elevation drawing. Hocken Collections / Uare Taoka o Hākena MS-3500/094. Dunedin monumental masons H.S. Bingham & Co. built the Mosgiel memorial. Established by George Munro about 1870, and taken over by Henry Bingham in 1911, the company continued in business until 2008. Its name can be found throughout Dunedin cemeteries, and other war memorials it built included those at North East Valley and Kaikorai, and the cenotaph at Queens Gardens. The cost of the Mosgiel memorial was a little over £600, about the same as a modest two or three bedroom house. Some proposed features, not specified, were left out to keep the cost down. The concrete base was complete by the time Major General Edward Chaytor laid the foundation stone on 26 August 1923. Sung items were ‘God Save the King’, and the hymns ‘O God Our Help in Ages Past’, ‘Land of Our Fathers’, and ‘O God of Bethel’. The Rev. David Calder offered a dedicatory prayer and David Hannah of the RSA read the roll of honour. Chaytor, presented with a greenstone-handled silver trowel, remarked that ‘The amount of good that these memorials would do in the future would depend on how the young were brought up to regard them. Those who lived at present knew what the war had meant in every way.’ He emphasised the ongoing struggles of soldiers returning to peacetime lives. 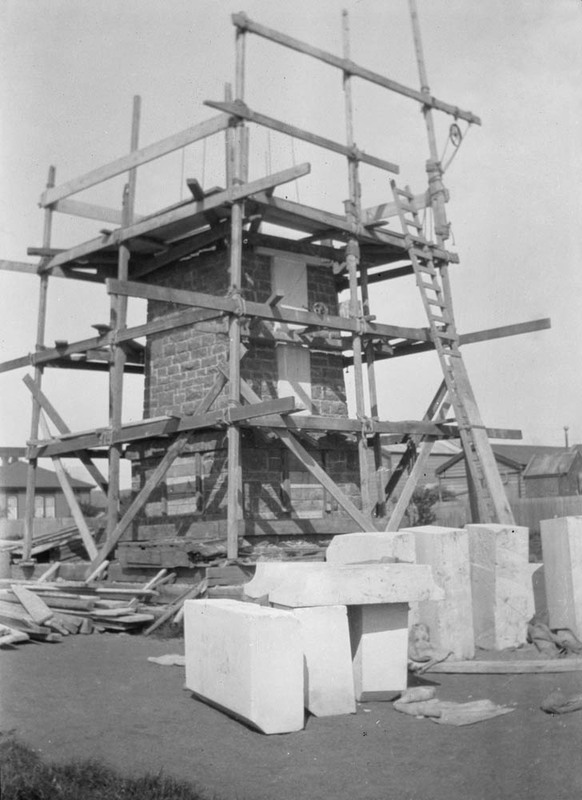 The memorial under construction in 1923. Image courtesy of the Mowat family. 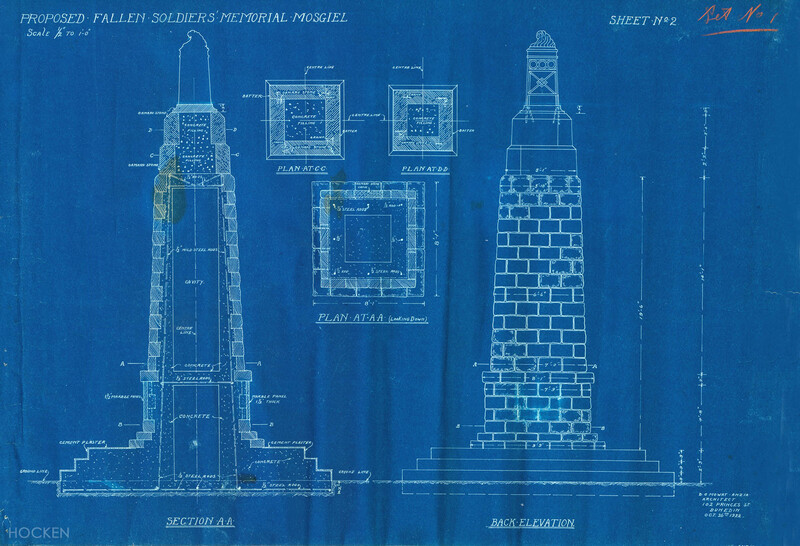 One of four sheets of blueprint plans for the monument held by the Hocken Collections (MS-0688/290) together with a specification. The monument, 9.1 metres high, is an obelisk rising from a square base with three concrete steps. The main shaft is steel-reinforced concrete, with a central cavity. Most of the facings are bluestone, but the top portion is Oamaru stone over solid concrete. A cross in white Italian marble, representing sacrifice, faces Gordon Road. The monument is surmounted by a bronze stand and bowl or urn, representing the sacrifice of non-Christian peoples and nations. Panels at the base name 60 fallen World War I soldiers, including John Blair Couper, who died as a result of his injuries in 1923. A biblical quotation comes from John’s gospel: ‘Greater love hath no man than this, that a man lay down his life for his friends’. Mosgiel mayor J.C. Browne died two weeks before he was due to dedicate the memorial, and his widow Margaret performed the unveiling on Armistice Day, 11 November 1923. The Mosgiel Brass Band and Taieri Pipe Band played. Charles Statham, independent MP for Dunedin Central and Speaker of the House, gave a speech emphasising the scale of the loss of life, and expressing hope for a time without wars. He said he ‘need hardly remind them of the response of every portion of the far-flung Empire to the Motherland’s call for assistance’, and offered condolences to those who had lost loved ones. 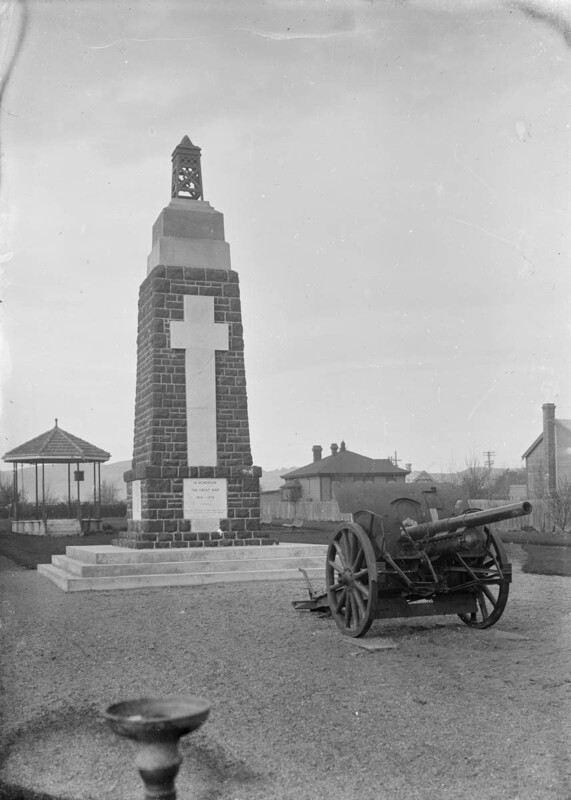 ‘Soldiers’ monument at Mosgiel’. Ref: APG-1566-1/2-G. Alexander Turnbull Library, Wellington. The War Trophies Committee had initially allotted Mosgiel four machine guns, but the RSA argued it should have a big gun, and in 1921 the town was allocated a 77mm Howitzer field gun captured by the New Zealand Division on 5 November 1918. It stood in front of the memorial for many years and was probably scrapped around 1956, when it was seen lying in a corner of the tennis court grounds with a collapsed wheel. After World War 2, tablets with a further 31 servicemen’s names were added to the shaft, and ‘Great War’ was given an ‘S’ to become ‘Great Wars’. The monument was extensively renovated in 2007 at a cost of $10,000, with stonework repointed and replacement marble name tablets installed. These are not replicas of the originals, which had lead lettering. 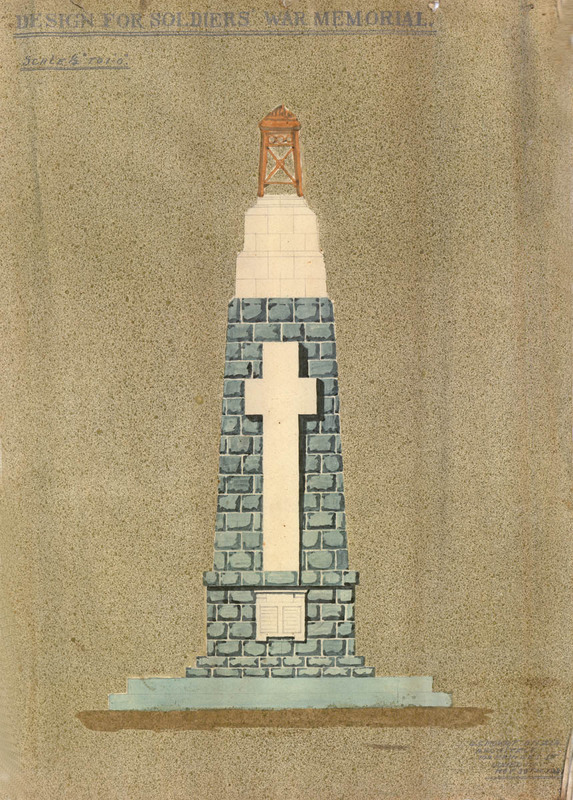 The monument has been referred to as the Mosgiel Cenotaph since at least the late 1930s. Strictly speaking it does not meet the definition of a cenotaph as an ’empty tomb’, but there are other examples of the broader usage (including at Queen’s Gardens in Dunedin). 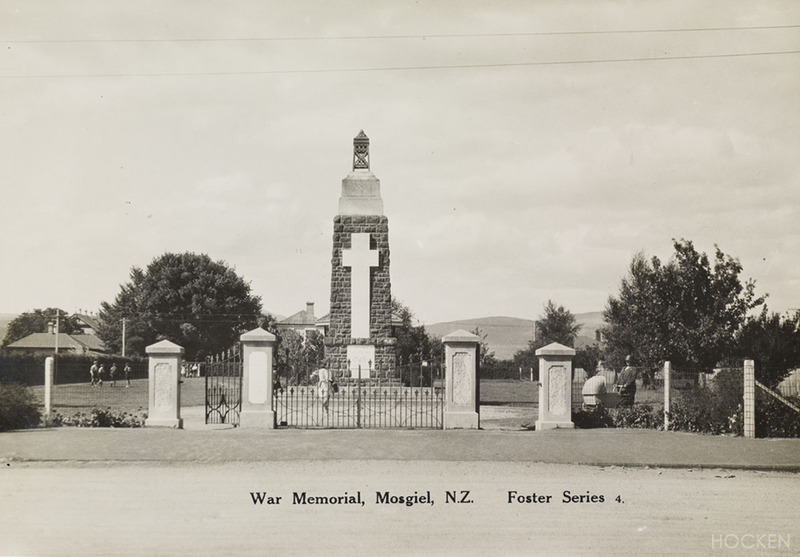 The Mosgiel Branch of the New Zealand Society of Genealogists has compiled two booklets of soldier biographies: Our Stories of the World War One Soldiers on the Mosgiel War Memorial Cenotaph (2016) and For the Fallen: The Story of the Thirty-one Men of WW2 whose names appear on the Mosgiel War Memorial Cenotaph (2007). My own grandfather’s first cousin, William Ernest McLeod, was killed in action at Jean Bart Trench near Colincamps, the Somme on 5 April 1918. He had worked in Mosgiel as a bricklayer for my great-grandfather, George McLeod, who was a borough councillor and member of the memorial committee. William was the only child of Isabella and William McLeod. The story in the family (precisely how accurate it is I don’t know), was that the post office boy came to deliver the telegram with the bad news on a lovely sunny day, and saw Auntie Belle working happily in the garden. He didn’t have the heart to deliver the telegram and came back later. Years after William’s death his parents placed a memorial notice that read: ‘Too dearly loved to be forgotten’. The memorial helps us to remember. Below is a list of the names on the memorial. If you click on a name it links to the serviceman’s record on the ‘Cenotaph’ database, which for World War I soldiers includes further links to digitised military personnel records. Newspaper references: Evening Star 28 April 1919 p.4 (handover of Mosgiel Park), 5 April 1920 p.4 (W.E. McLeod), 16 Apr 1920 p.3 (Taieri RSA), 4 May 1920 p.7 (machine guns allotted), 21 May 1920 p.2 (public meeting), 15 September 1920 p.6 (fundraising concert), 26 March 1921 p.7 (call for design submissions), 19 December 1922 p.7 (site and moving of rotunda), 30 December 1922 p.1 (call for tenders), 26 May 1923 p.4 (rotunda to stay in same position), 14 July 1923 p.4 (contract awarded to Bingham & Co.); Otago Daily Times 16 November 1917 p.2 (proposed memorial building), 17 January 1918 p.4 (gift of park), 28 April 1919 p.8 (handover of park), 15 May 1919 p.4 (peace celebrations), 14 July 1919 p/5 (peace celebrations), 24 July 1920 p.10 (memorial for whole plain, committee appointed), 5 April 1921 p.4 (W.E. McLeod), 18 May 1921 p.4 (meeting, vote on location), 7 Jun 1921 p.7 (trophy guns), 30 September 1921 p.7 (Taieri Male Choir concert), 7 November 1922 p.9 (approval by Mosgiel Borough Council), 6 February 1923 p.9 (proposal to dismantle rotunda), 25 July 1923 p.9 (list of soldiers’ names); 27 August 1923 p.10 (foundation stone), 27 October 1923 p.14 (J.C. Browne obituary), 12 November 1923 p.8 (unveiling). Otago Witness 18 December 1918 p.26 (club house opened), 16 July 1919 p.19 (peace celebrations), 14 September 1920 p.23 (West Taieri memorial); Taieri Herald 10 September 1985 p.3 (‘Anzac Park work ready to start), 13 February 2007 p.1 (‘Memorial restoration underway’). Our stories of the World War One soldiers on the Mosgiel War Memorial Cenotaph. (Mosgiel: New Zealand Society of Genealogists, Mosgiel Branch, 2016). Mosgiel War Memorial Cenotaph (Mosgiel: New Zealand Society of Genealogists, Mosgiel Branch, and Mosgiel Memorial RSA Inc., 2007). ‘Mosgiel’s Missing WW1 War Memorial Trophy Gun’ from The Hangfire: Newsletter of the New Zealand Antique Arms Association (Otago Branch), March 2015. Phillips, Jock. To the Memory: New Zealand’s War Memorials (Nelson: Potton & Burton, 2016). William McLellan Ltd records, Hocken Collections / Uare Taoka o o Hākena, ref: MS- 0688/290 (blueprint plans and specifications), MS-3500/094 (elevation drawing). Special thanks to David and Miriam Mowat, Bill Lang, and Chris Scott (DCC Archives). A version of this post was published in the Otago Daily Times on 10 November 2018. This entry was posted in Monuments and tagged 1918, 1923, Anzac, Bingham, concrete, D.G. Mowat, Mosgiel, peace, soldiers, stone, war, war memorial, World War I on 11 November 2018 by David Murray.